I have to thank Julian Cope for my deep passion for standing stones. That might sound one of the craziest sentences you’ll read all year, but it’s true. The erstwhile eighties rocker is perhaps best known for his stint as frontman in eccentric Liverpudlians The Teardrop Explodes, but after he quit the music scene, he became very interesting indeed. Julian has written a number of books centred around megalithic culture and his best by far is his almanac to all things megalithic in Britain – The Modern Antiquarian. I bought it many years ago and was hooked. In it, the ‘Drude’ – as he sometimes known – travels the length and breadth of the country visiting every single stone circle or site of ancient significance. It’s a wonderful combination of new aged spaciness and soup to nuts academia. It’s serious and kooky and I love it. It was because of this book I found myself squelching through a field in Wiltshire, in the failing light and wearing inappropriate footwear on a damp December afternoon. 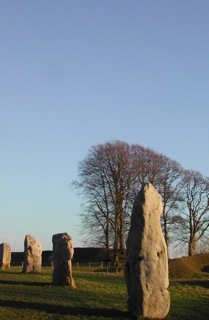 The church bells tolled insignificantly as I wandered among the ancient stones of Avebury. If you’ve never been to Avebury, I would urge you to go there next time you happen to be even vaguely nearby. It’s the largest collection of megalithic stones in the UK (probably the world) and unlike its flashier neighbour Stonehenge, these stones can be touched, caressed, hugged, kissed. In fact when you’re there, you’ll see people doing this and plenty more besides to them and with them: they have that kind of effect on people. The sheer scale of the stones and the earthworks surrounding the village takes the breath away and the absolute mystery surrounding their use and purpose only adds to the experience. There’s nourishment to be found there too – a kind of food for the heart and soul that the modern world can’t offer. There’s a lot of stuff happening there and the very fact it confounds our rational brains makes it even better. It might seem like I’m going off on one (and I probably am) but ask anyone who’s been to Avebury and they’ll tell you that I’m not wrong. This is a place so ancient we don’t know who built it, how they built it, why they built it or what its purpose was. We can only guess at its meaning and the motivations of its architects. And in our age of relentless thirst for knowledge, that can only be a good thing.